I have given your predicament a great deal of thought. Let it be first said that you are a brave man, after all, who wants to be a CEO in the 21st Century? Nothing is predictable and butterflies have taken over the world. The world is flattening fast, everything you were taught no longer applies, you bring in ‘Gen Y’ 5-star MBAs yet they trip into the abyss, the more you invest in strategic thinking, planning and execution, the faster you fail. When you do get to manage by wandering about, you experience a socio-economic system that is in full flux. Lately our sessions reflect your erratic state of mind, you remind me of a rabbit caught in a spot light. Occasionally your questions are profound; “are we done with Collins’ ‘built to last’ logic today?” What causes digital disruption? Why are company life cycles getting shorter and shorter? The tenures of CEOs now makes you LOL (that’s ‘laugh out loud’ in 21st Century digitalk). Tick tock tick tock, who's neck's next on the block? You are right of course, when you say that industrial age strategic thinking, planning and execution frameworks, and present day management gurus are mostly no longer fit for purpose. So WTF (another 21st Century digitalk) are we going to do about this? I have taken the liberty of putting pen to paper, of writing this open letter to catalyze you into action thus making our next session easier for the two of us. Eisenhower once said, "Plans are worthless, but planning is everything". Yet, given all the intellectual masturbation we put into strategic planning and executing we are not assured that we will be here in 3 years’ time. And!!! the world has been taken over by butterflies. Recall the Butterfly Effect? Chaos theory? There are Black Swans and Ubers on the other side of the world scheming disruptive business models and strategies to gobble your market share and leave you with a fabulously efficient business no one wants to buy from. Depending on the decisions you take now, they will win or you will win. Last Thursday you said ‘I am on a hiding for nothing, so why persevere?’. I’ll tell you why. It’s because you give a damn and because you are Homo Sapiens, and one thing you know is fortune favours those who adapt and run fastest. We, as a society, are transitioning from the Industrial Age, stumbling fast and furiously into the Digital Age and if you want to stick around and fulfill your dreams you better learn the art of ‘letting go’ of the tried and tested and ‘let in’ therapid build, measure, learn cycles, the kaikaku. You must start co-creating an ecosystem of connections that are alive, agile and adaptive. More and more CEOs find themselves in your predicament. Yesterday everything was complicated yet predictable, today they woke up and found themselves ping ponging around in a highly volatile, complex and unpredictable environment. Imagine yourself as a CEO in Nigeria. Over the past year the environment has become more and more challenging; exchange rate fluctuations, $US dollar restrictions, a massive anti-corruption drive throughout the country, unpredictable atrocities in the North and to cap it all off the government and every business owner is trying to peg their strategic plans and annual budgets (round pegs, no puns intended) against the backdrop of highly complex unpredictable oil prices (square holes)! You could be in Syria, in Lebanon, operating out of The City of London figuring out what’s next in financial meltdowns. They all share in this common curse. 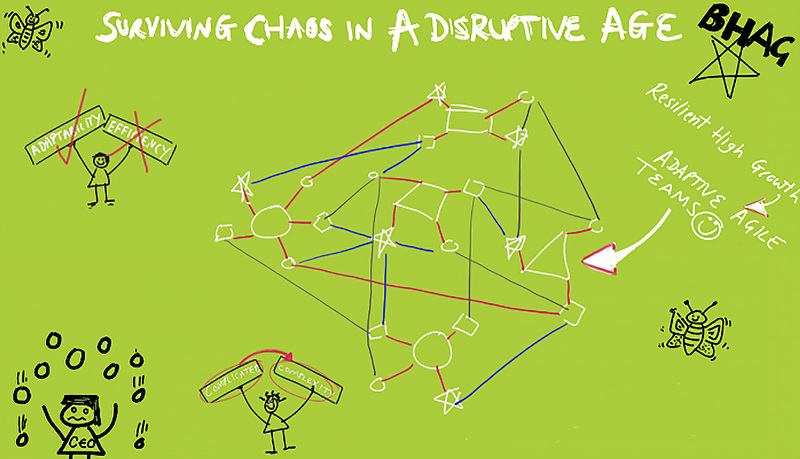 Disruption is the result of moving from structured predictable systems of the industrial age to the complex volatile systems of the 21st Century and not being able to adapt and accelerate in this brave new world. Up until the birth of the internet, building your business was all about efficiencies and focused hard work. It was not the highly complex digital world it is today. You as a CEO could reliably think plan and act on your 3 year strategic plans and build lasting robust businesses because the world although highly complicated, it was logical and predictable. Today we are in a fluid state between the industrial age of our fathers and the digital age of our grandchildren, the world is ‘flat’ 'ugly' and ‘highly complex’ therefore it is ‘unpredictable’. This is the new reality and your industrial aged thinking cannot survive here. Let go! Successful CEOs are continuously adapting to the new reality and this means continuing to build robust efficient systems but they now are also creating resilient systems at the core. Resilience is about being highly adaptive, being able to let go of plans when they no longer make sense, it’s about creating cultures of people that can rapidly execute without the traditional command and control yet stay focused on the end game, the BHAG the company strives to achieve. Your challenge Mr. CEO, your true, ultimate challenge you face today is to grasp and understand complexity. The world is in flux, and flux is great way to evolve fast. 2. From “complicated to complexity.” The world where “Efficiency” was a competitive advantage is receding like your hairline, accept this and build adaptability to win in a complex world. 3. The shelf-life of information and staying ahead is less and less, nobody knows anything, there is no permanent fix. Build, Measure, Learn! 4. Be brutal about discovering your LIMFACs (“limiting factors”). 5. Create cross-departmental Rapid Execution Teams, Structures and Systems and dismantle “silos”. Give them space to think, plan, act with focused, high impact Daily Scrum huddles and Weekly Sprint meetings. You once said you were here to change the world. It’s time to make this happen. Are you “IN’ or “OUT”? I look forward to our next session. Before you do, pick up those copies of Jeff Sutherland’s SCRUM: Doing twice the work in half the time and General McChrystal’s Team of Teams: New Rules of Engagement for a Complex World.